J.D. “Coach” Granado is an Odessa native that loves his city. He graduated from Permian in 2005 and then headed to college at Texas Tech University. As in many stories, “life happened” and J.D. Granado was called back home, because he was an expectant father. 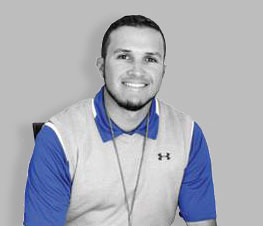 He began volunteer coaching in 2007 as he continued his education at The University of Texas of the Permian Basin. J.D. worked various jobs during his time at UTPB, including landscaping, HVAC and also car sales. It was during his time at the Sewell Family of Companies that he received wonderful leadership training and learned how to truly serve people and meet their needs. His passion to serve the people of our community is unparalleled. As mentioned earlier, Coach Granado began as a volunteer coach for youth football in Odessa in 2007 and has been coaching ever since. In 2015 he got his first official Teaching/Coaching opportunity at Ector Middle School in Odessa, TX, where he is still helping to shape and mold the lives of the youth of our community. Although Coach Granado is considered a “Part Time” realtor, if you give him the opportunity to serve you, he will give you the same “full time” service you would expect to receive from any great realtor. Your message was submitted successfully! Donna Belt Real Estate will respond as soon as possible. Donna Belt Real Estate located in Odessa, TX. Proudly serving both Odessa and Midland. Buying or selling a home is an important decision. Contact one of our agents today!